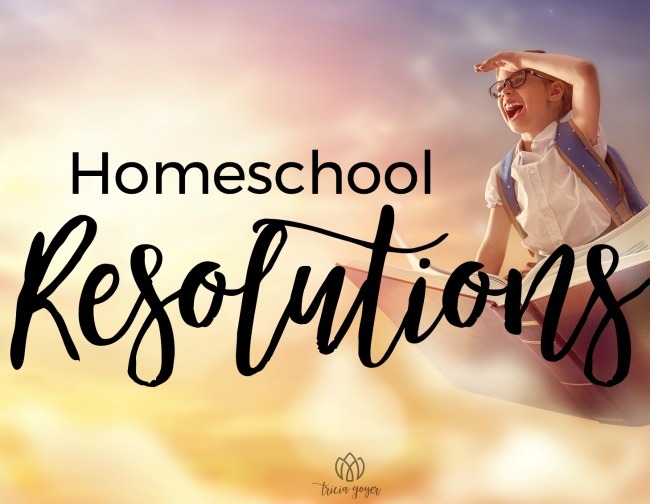 Are you making any resolutions for your homeschool before the new school year starts up? I’m counting down the days until homeschooling starts this year. I love the beginning of the new school year. I love new school supplies. I love cracking open new books! I love learning right along with my children. Yet each year there are always challenges. At the beginning of each new school year, I make note of these challenges and try to come up with resolutions—things I can do to make positive changes. Sometimes these resolutions work. Sometimes they don’t, but it’s always worth trying something new to fix a current problem. A few years ago my homeschool problem was teaching six different grades for six different kids. I was only one person. How could I manage that? Intro to World History Year 2 of 2, Literature C. We’ll be journeying from the fall of Rome through modern world History. World History, Year 2 of 2, Literature H. Again, we’ll be exploring the ever-changing world of the past 500 years. For the last two years, I’ve loved using Sonlight for my kids. I read Read Alouds from both of these sets of books to all my kid, ages 7-15. Since both sets of kids are studying the same time period the books are both enjoyable and educational. We have all loved this, and it has really bonded our family. To have our kids from Grades 2 – Freshman laughing and sometimes crying over the same books has given us common ground. The kids do have individual subjects they are learning, too, but it’s fun to see my children sharing these stories with each other. Spend time with others, including more homeschoolers. Just homeschooling seven kids has taken up a large chunk of our day, but I’m looking into finding small co-op activities to do with other, local homeschoolers. To actually do the Science projects. Confession. My 18-year-old Maria, who is now in college, was the one who did Science projects for me. This will mean I’ll have to pull out the manuals for the kids myself. Follow rabbit trails, instead of just trying to get the next thing done in the teacher’s guide. Like my friend Lyndsay recently confessed to me, “Last year had to hold too many ‘check the box’ kind of moments. I want and crave more ‘explore and dig’ moments. Not so rushed.” I can totally relate. Memorize more Scripture. We’ve memorized a few verses, but I know my kids would do great with this challenge. It’ll just take me challenging them. Pray more about our homeschooling journey with my kids. I do pray about homeschooling (mostly that God will give me wisdom, patience, and strength), but I want to encourage my kids to start praying too. I know it will make all the difference. What about you? Made any resolutions n the past that have changed things for the better? Also, do you have any current resolutions? I’d love to hear! I’ve found that I pray more and deeper when I keep a prayer journal. Maybe that’s a tool you can use with your kids? Jus a little notebook with pictures/ names of things they want to pray about each day. Amps up writing skills too.